GRAND RAPIDS — “Next Fall” is the kind of play that makes you think about the characters and their story for a long time after the curtain call. A full house at Spectrum Theater on Thursday night was moved to tears and laughter, sometimes at the same moment, as six gifted players told the tale of Luke (Dylan Harris) and Adam (Larry Young), a gay couple with striking differences in their world views. Luke is an evangelical Christian and Adam is an agnostic. The play opens with Luke lying in a coma, the victim of a car accident, with his friends and family converging upon a Jewish hospital in New York. The fact that the hospital is Jewish factors into the conversation about faith, or lack of it. Catholicism, Judaism, evangelicalism and agnosticism all are discussed to varying degrees. There are no pat answers in a script that raises excellent questions of what it means to believe. What falls away and what rises to the surface as death and loss lurk in a hospital corridor? End-of-life decisions must be made for Luke, and Adam is shut out, not only of the decisions, but Luke’s hospital room as well. 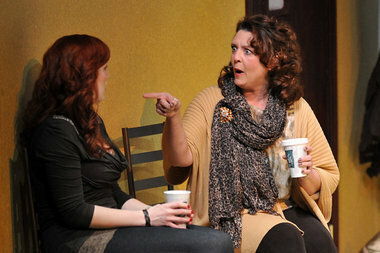 Read the rest of the review for Next Fall here on www.mlive.com. There are still some seats available for this upcoming weekend! Go to www.atgr.org today to order your tickets.